DA 230, Dual-Channel Power Amp from KME. 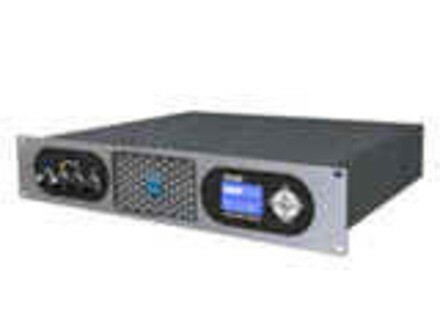 This 2-channel amplifier DA 230 is equipped with DSP features like matrix router, 6 parametric equalizers two crossover networks, delay and dynamic processor per channel. Factory and user presets may be stored inside the unit, an SD-card reader is implemented and can be used to transfer preset and system information to other units. All parameters as well as user navigation can be managed using a 5-key navigation pad together with 4 rotary encoders. The user interface is completed by a graphic LCD display and 4 RGB LEDs informing about relevant operation parameters and state of the single channels. On the inputs side are two analogue or one digital XLR connectors which can also be used mixed. Link sockets, either carrying the signal applied to the inputs can be routed as processed digital outputs. The outside power connection was realised using a self-locking Neutrik PowerCon connector, two Neutrik Speakon sockets ensure the connection to the speaker systems. The designers also implemented a module slot for future updates, i.e. connections to audio / control networks, standard- fitted with module RSNC equipped with a RS232 connector and a 'normally closed' contact feature. From now on Firmeware-Updates can also be transfered by an SD-card on DA 428 and DA 230. K.M.E. will exhibit at Musikmesse in hall 8.0 stand E 56 and live on stage the PANO Line-Array at Concert Sound Arena at the open air area with daily presentations at 12 p.m., 2.40 and 5.20 p.m. Check out www.kme-sound.com for more info. Fender Passport Pro Series Fender's announced three new Passport systems—the 500 PRO, 300 PRO and 150 PRO. Audio-Technica Upgrades the BP892 Audio-Technica is enhancing its BP892 MicroSet Subminiature Omnidirectional Condenser Headworn Microphone with the AT8464 Dual-Ear Microphone Mount. [Musikmesse] New Meyer Products Meyer announced they will return to ProLight + Sound / Musikmesse this March with two recently debuted loudspeaker products, the CAL steerable column array loudspeaker and the JM-1P arrayable loudspeaker.